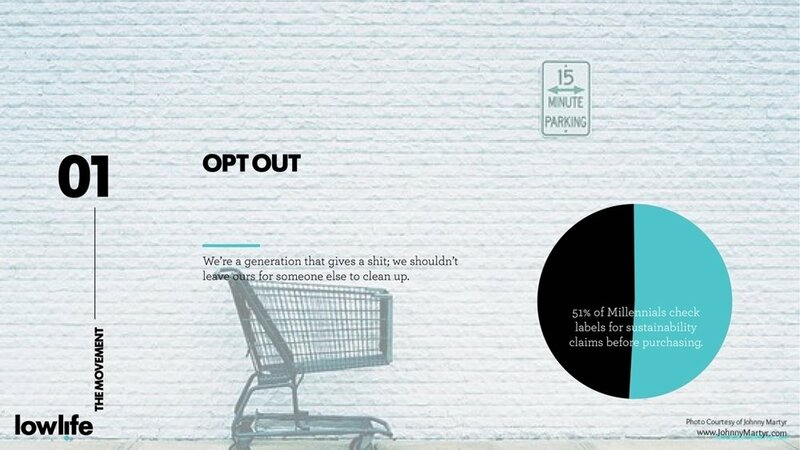 How might we encourage zero-waste habits in young consumers? Fast-fashion and the push for trendy, low quality products, has set cultural mindset toward disposability. Lowlife is a furniture brand inspired by the zero-waste movement, combining sustainable material sourcing and multi-functionality with a pop culture twist. Lowlife makes eco-conscious furniture that doubles as moving boxes for one of the most notoriously wasteful groups of all - college students on the move. In collaboration with Karen Vellensky and Alexa Forney; Guidance from Aruliden. Houston isn't the only one with a problem. Americans toss out 9.8 million tons of furniture a year. Low quality, cheap furniture are the typical culprits for disposable furniture, often marketed to college-age kids who move frequently. When once-precious products are at a disposable price point, it becomes easy to think "just toss it, I can buy a new one anyway." The just-buy-a-new-one mentality has dangerous consequences for resources and the environment. Designing for dorm-bound students that are newly independent and trend-oriented. According to a Nielsen study on global retail analysis, 51% of millennials check labels for sustainability claims, and 66% of consumers are willing to pay more for sustainable goods, we saw a white space in the market. College students have the new freedom to make their own purchasing decisions - an opportune time to ingrain healthy consumer habits. To appeal to the target demographic, our brand language drew influences from popular culture, infusing a Japanese brand aesthetic and focus on quality with an American pop culture edge. Lowlife makes multi-functional furniture that can interlock to create new configurations. Each unit also doubles as a moving box. College students move frequently - once a year if not more. Movability was a critical consideration in the design, as well as durability and multi-functionality. Space constraints and furniture needs also change with each new apartment and set of roommates. The first product, HEX, can serve as seating, shelving, or storage, and can interlock with other HEXs for modular arrangements. HEX conveniently double as packing boxes for when it's time to move on to something bigger and better. Lowlife is lightweight and durable, made from 100% recycled plastics. 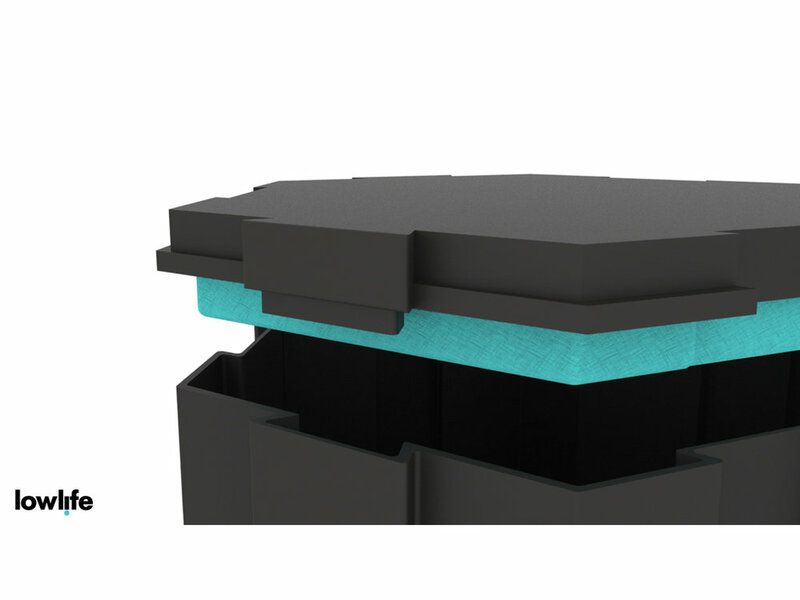 The snap lid has a cushion on the underside that can be used as seating. Plastic may get a bad rep when it comes to sustainability, but with a consultation with Material Connexion for structural requirements and manufacturing options, plastic proved to be the most eco-conscious choice in the longterm. As part of the zero-waste movement, units are made from 100% recycled plastic in unique patterns from Smile Plastics for a lightweight and durable product. The product has minimal packaging - simply a fabric tag made from offcuts of upholstered seating material. Using offcuts reduces fabric waste, and upholds the brand's focus on sustainable products and manufacturing processes. Inspired by the low-to-ground tatami style of Japanese living, we saw height similarities to the college student who never quite manages to buy a bedframe for their mattress.We looked further into the Japanese design aesthetic, and developed a branding color palette influenced by a traditional Japanese tie-dying method, shibori, combined with the neutrality in Japanese minimalism. While the objectives are to promote sustainability, the brand appeals to consumers through practicality and playful messaging. Sustainability-oriented initiatives may often take a serious tone, but lowlife strives to attract young consumers through casual and cheeky messaging, while maintaining the core values of responsible and sustainable product development. 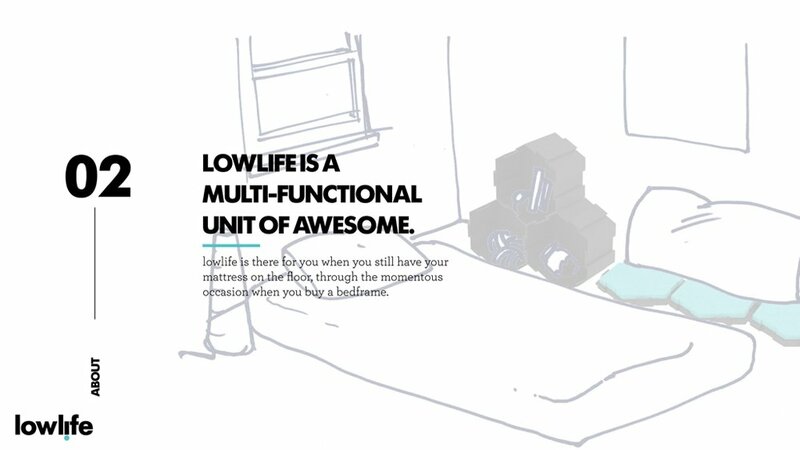 To ensure the product meets the needs of users and to avoid contributing to the waste stream, Lowlife has a built-in second life as both storage units and diverse use cases, ranging from seating to shelving. A retail display was mocked up to showcase the physical prototype. Deliverables included a fully branded product, including a pitch deck, physical model, and retail display. The retail display features hand illustrations to suggest room context, and use cases for lowlife. The product was displayed in Spring 2017 at the SVA Products of Design Gallery, where visitors could interact with the full-scale prototype.